First song at the school bus where Dahmer looks out the window and stares at a jogger. Plays in the car of one of the students as they arrive at the Revere High School. Dahmer gets out of the school bus. Dahmer is playing the Trumpet with his classmates at band rehearsal. 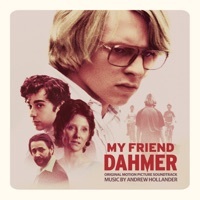 Plays in Dr. Matthews’ car as he parks near Dahmer and his friends. Fig shows Dahmer and his friends the knife his father used during World War II and begins slicing his hand in front of them. Dahmer is staring out the window as Derf’s friends smoke weed. Derf and his friends talk about how they’re going to get Dahmer to spazz to the max. Derf and his friends drive with Dahmer to the mall. Dahmer, Derf and his friends arrive at the mall and pay Dahmer to spazz out at the mall. Dahmer stops annoying the customers and sits a table by himself. Dahmer finds Derf and his friends and stands next to them. Dahmer and his date arrive at Prom. The students are slow dancing at the Prom as Dahmer and his date sit at a table. His date tells him to get punch and bumps into Neil who apologizes for what happened at the mall. Dahmer slow dances with his date and meets Derf and his date at the dance floor. Dahmer then leaves his date at the dance floor. Derf and his friends are dancing at the dance floor as Dahmer’s date sits by herself at a table. Derf’s mother enters his room and tells him dinner is ready. Derf is driving home when he spots Dahmer walking by himself at night and offers him a ride home. Derf drops Dahmer at his house. Plays on the car radio as Dahmer drives out of the house. Dahmer is driving around town and stops when he notices a hitchhiker and decides to pick him up. The hitchhiker introduces himself to Dahmer as Steven Hicks and gets inside the car. The closing credits note that Steven Hicks was never seen again, and that Jeffrey Dahmer admitted to killing 17 men when he was finally arrested. I don't want to have to watch the whole movie again. Does anyone have a list of the songs played during the credits (trying to find just one)? Thanks.